It is a new gadget that could be straight out of George Orwell’s 1984. 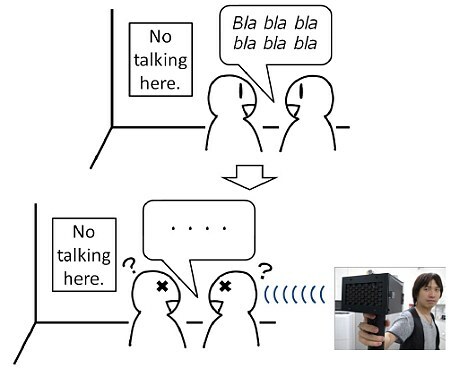 Japanese researchers have invented the ultimate conversation killer and instrument of control – a machine that can shut someone up at will. Kazutaka Kurihara and Koji Tsukada have built a gun they call the ‘Speech Jammer’, which could be ideal for an unruly classroom or noisy library. It forces individuals into ‘vocal submission’, they say, and is accurate when fired from up to 30 metres away. When it is shot at someone speaking it keeps them quiet almost instantly using a technique that stresses humans into silence by freezing their brain. This technique, called ‘Delayed Auditory Feedback’, is according to psychologists almost certain to interrupt your speech, make someone stutter and then render them totally silent. It will not cause the person pain, but it will stress them into shutting up – recreating an uncomfortable feeling that most people will have experienced when they hear their own voice echo back to them during a phone call or on Skype. ‘In general, human speech is jammed by giving back to the speakers their own utterances at a delay of a few hundred milliseconds,’ the scientists say in a new research paper for the National Institute of Advanced Industrial Science and Technology in Tskuba and at Ochanomizu University, both in Japan. 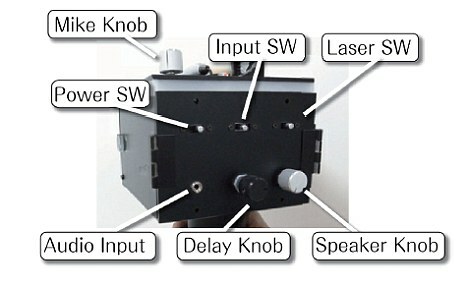 ‘This effect can disturb people without any physical discomfort, and disappears immediately by stop speaking. A preliminary study has found that it worked best when used on someone reading a pre-prepared speech rather than more spontaneous chat, meaning it would be perfect to quieten your least favourite politician. But the device is not all bad, because it could improve the lives of people with a speech impediment. 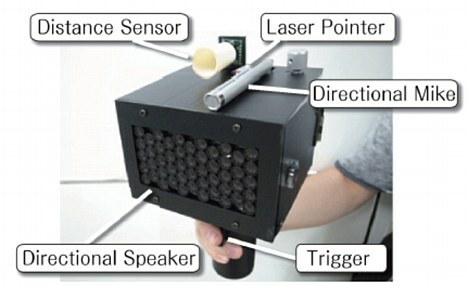 It is understood the gun could help improve speech for someone with a stammer. Delayed auditory feedback (DAF) has been shown to improve fluency in many individuals with the problem.